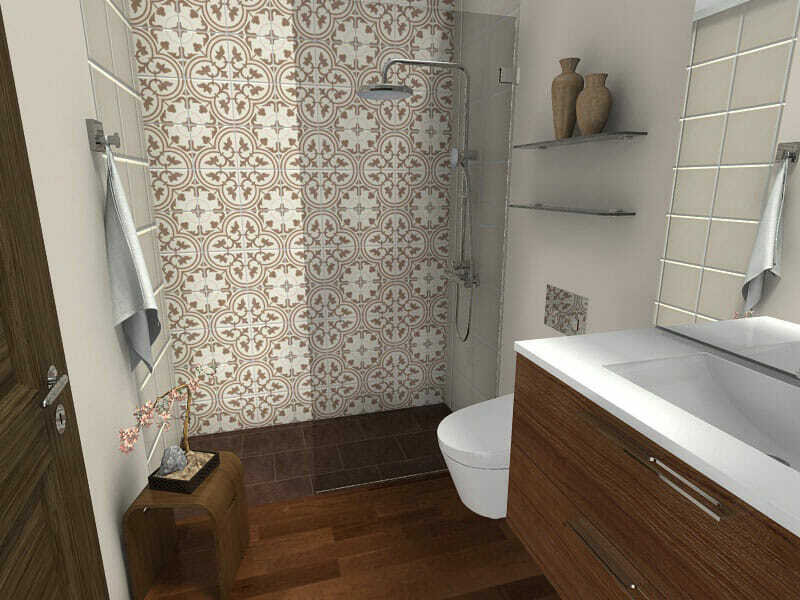 Bathroom layouts can be a challenging, but a small bathroom can be particularly challenging. 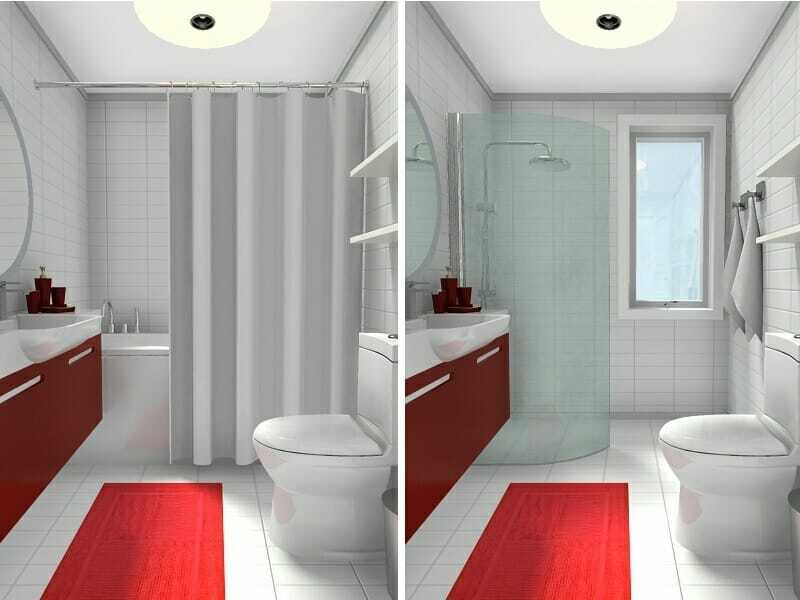 If your bathroom is short on space and you need some small bathroom ideas to make it work, then you have come to the right place. 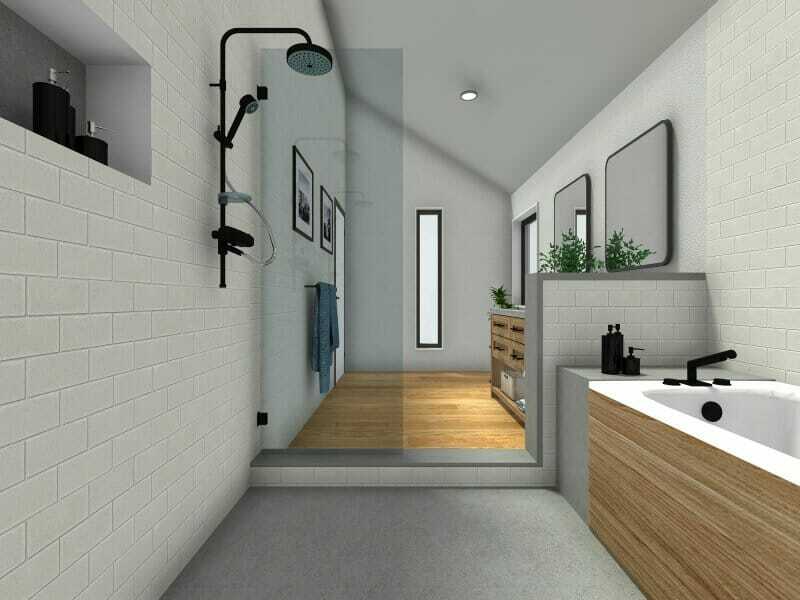 Every day here at RoomSketcher, we see hundreds of bathroom designs, floor plans and remodeling projects, from all around the globe. We work with customers just like you to help you create floor plans and to visualize your design ideas in 3D. 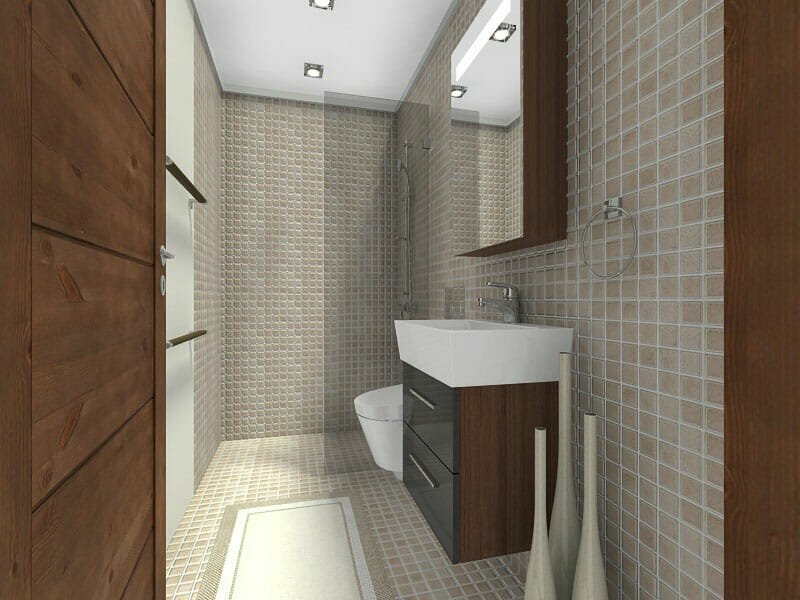 One of the projects that we see people struggle with the most is small bathrooms. As the small bathroom above shows, adding a mirror across a whole wall can double the look and feel of a small room. This is particularly effective above a vanity or along one side of a narrow bathroom. Mirrors are also great for reflecting light, so you can get more lighting from your light fixtures or windows. 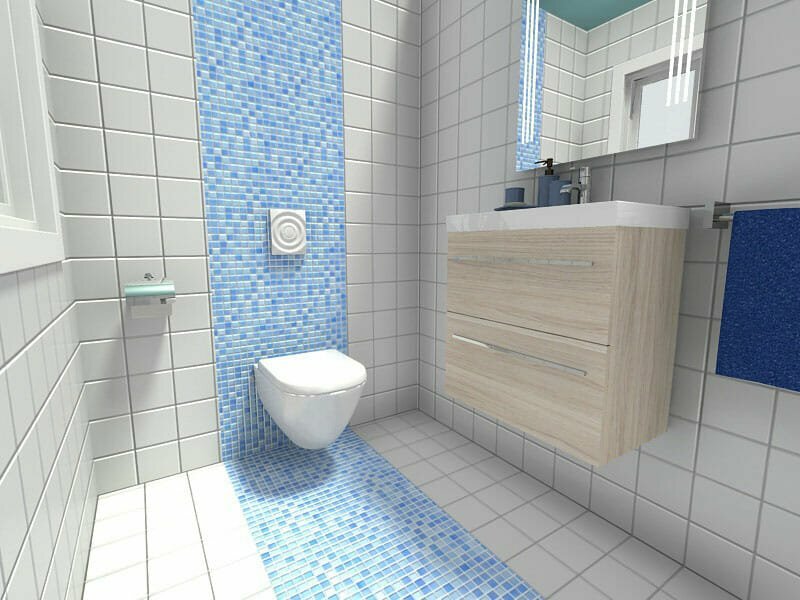 If you have space in the walls of your small bathroom to build-in a toilet tank, you can save both floor space and legroom with a wall mounted toilet. If you can’t wall mount the toilet, consider adding shelving above the tank for additional storage or extending your vanity top to create a narrow ledge. Tubs take up twice the amount of floor space than showers. If you have the option to lose the tub, you’ll open up your small bathroom significantly. Showers are great for adults and guests, especially older ones. If you add a hand shower, showers are also excellent for getting pets clean too. However, if you have children and you need to keep the tub for bathing them, then consider a lower profile tub. The lower height makes getting in and out easier and it will make your room feel more open as well. Let’s be honest, no one likes shower curtains. They stick to you when you’re showering and they are a pain to clean. 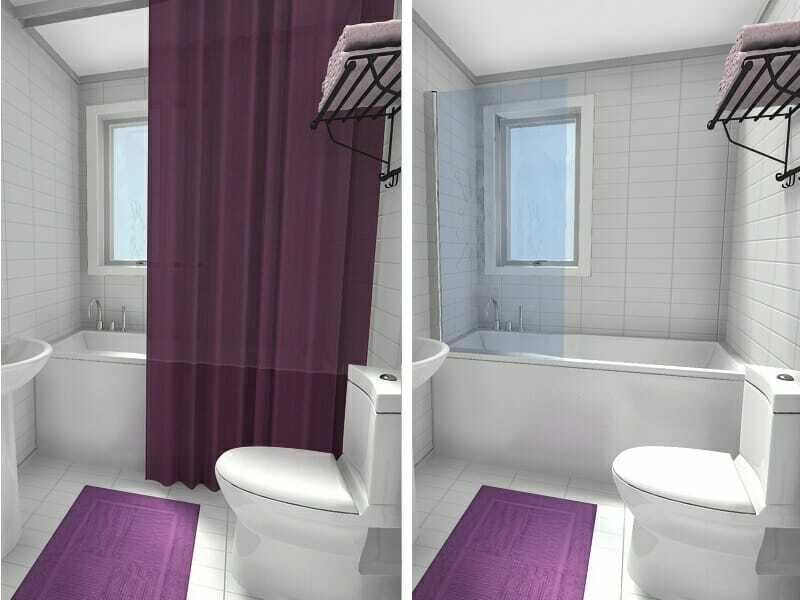 Shower curtains also close off one-third of your room visually. To prevent this, swap out your shower curtain with a frameless glass panel instead. This will open up your bathroom significantly and allow more light into your shower or tub. Glass panels are easy to install, maintain and are perfect for small bathrooms. They can be either fixed in place or hinged to swing. You can fold hinged glass panels inward when the shower is not in use as well. Avoid sliding glass panels, which require top and bottom tracks and are more difficult to clean. 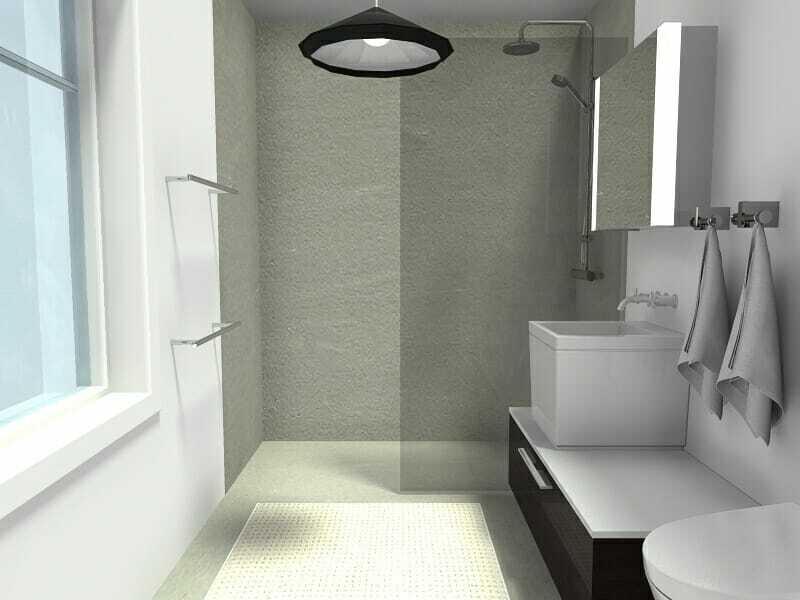 Here is one of our favorite small bathroom design ideas – curbless showers. By eliminating the curb around your shower, your flooring can continue right into the shower. This works great with concrete, stone slab and tile floors. You can even incorporate a concealed or infinity-edge drain for a really seamless look. Plus curbless showers are easier to clean. As with wall mounted toilets, wall mounted sinks are an excellent way to save floor space and to make your small bathroom appear more open. If storage is key, try a wall-mounted floating vanity. Look for narrow washbasin designs and for the newer thin-edge sinks. The ceramic is just as strong as it is with a traditional sink and you’ll get a larger washbasin in less space. In small bathrooms, storage is often sacrificed. While there may not be available real estate on the floor of your small bathroom, there is on the walls. Opt for recessed medicine cabinets with mirrored fronts above your sink. Add shelving on the wall above the toilet, at the end of a tub or above the entry door or vanity mirror. Use narrow open shelves to keep the look light. Metal towel racks also work well. For cabinets, look for ones with glass fronts. Don’t forget the back of the door, it is a great place to add towel bars or robe hooks. For more bathroom storage ideas, see these DIY bathroom storage ideas. Beyond eliminating the tub, one of the biggest space saving small bathrooms ideas you can consider is to switch from an in-swinging entry door to a pocket door. To install a pocket door you will have to open your wall to create the pocket. However, you can gain up to 9 square feet of usable space that you did not have before. You will have more flexibility when placing your fixtures as well. You can also look for surface-mounted sliding door hardware to create a modern sliding door or barn door look. With small bathrooms, you want to be strategic with color. Dark walls will make an already small bathroom feel smaller. Light walls will reflect more light and make your small bathroom feel larger. Reserve dark colors for the floor or keep the overall scheme light. If you have wood floors, look for shower tiles that match the wood in color and tone. This will create the illusion of a continuous floor and won’t draw your eye to the smallest part of the room. For more bathroom finish ideas, see these bathroom design ideas. 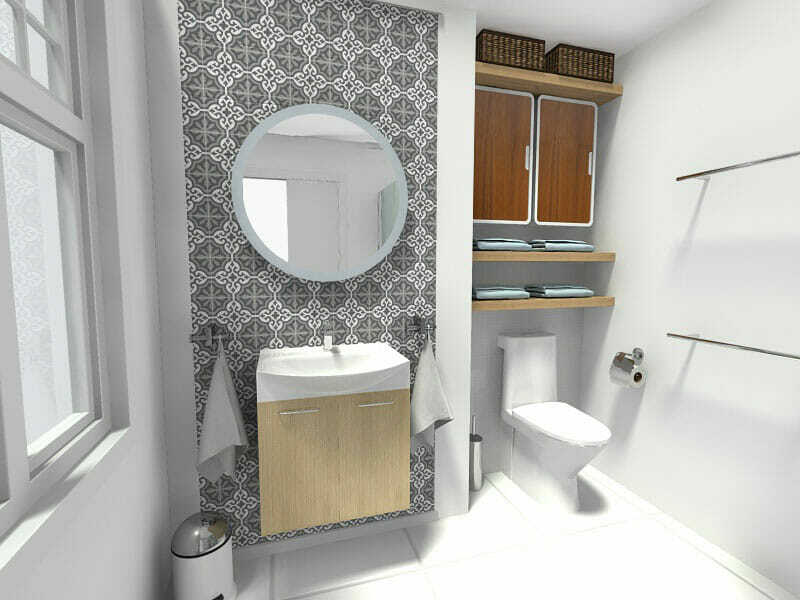 We saved the best small bathroom design idea for last. Adding an accent wall is one of our favorite small bathroom ideas and it’s a great way to add some color to a small bathroom. In a small bathroom, you will want to place the accent wall on the back wall. You can add color to the whole wall or just a band of color. This technique will give your room depth and interest without overwhelming it. You can create an accent wall with paint or a fun colorful tile. If you want to add some pattern, then use it in the same way – either on the floor or to create an accent wall. Keep the rest of your walls simple and light in color to not dilute the effect. 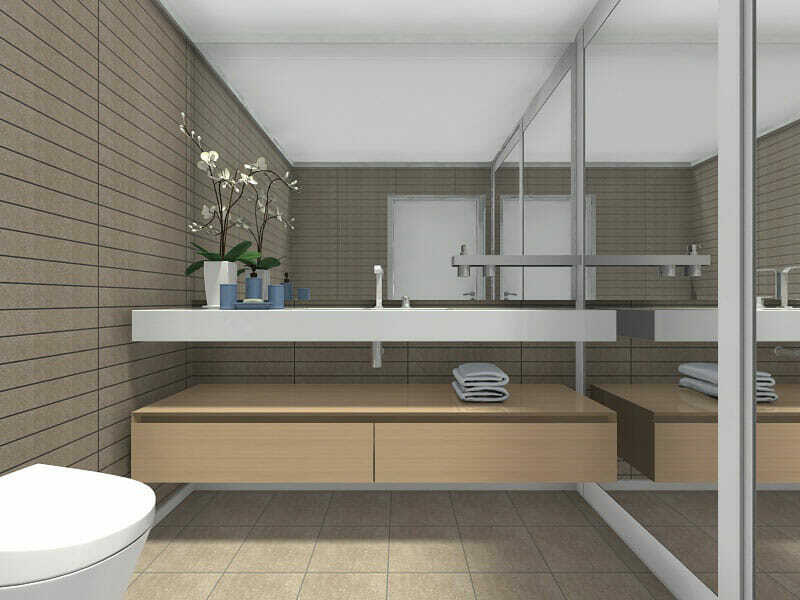 These small bathroom design ideas were created using RoomSketcher. 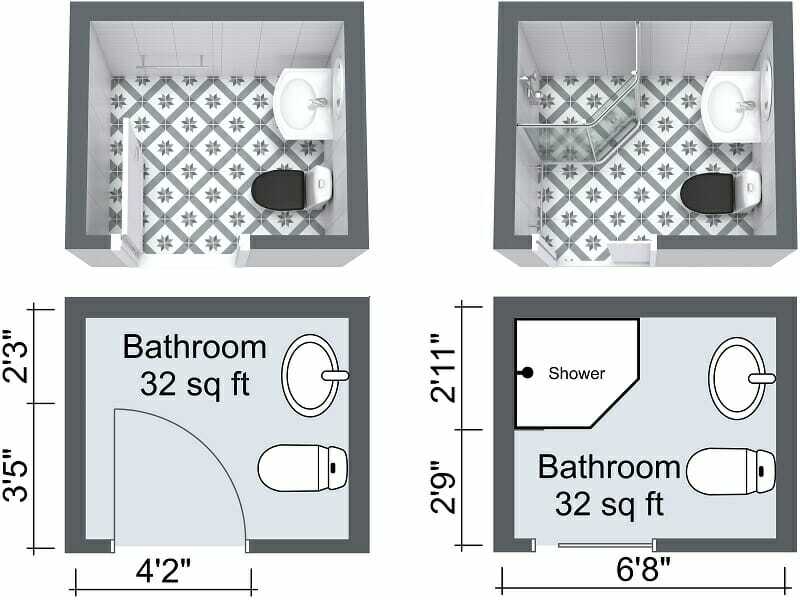 RoomSketcher provides an easy-to-use bathroom planner that you can use to design your bathroom online. 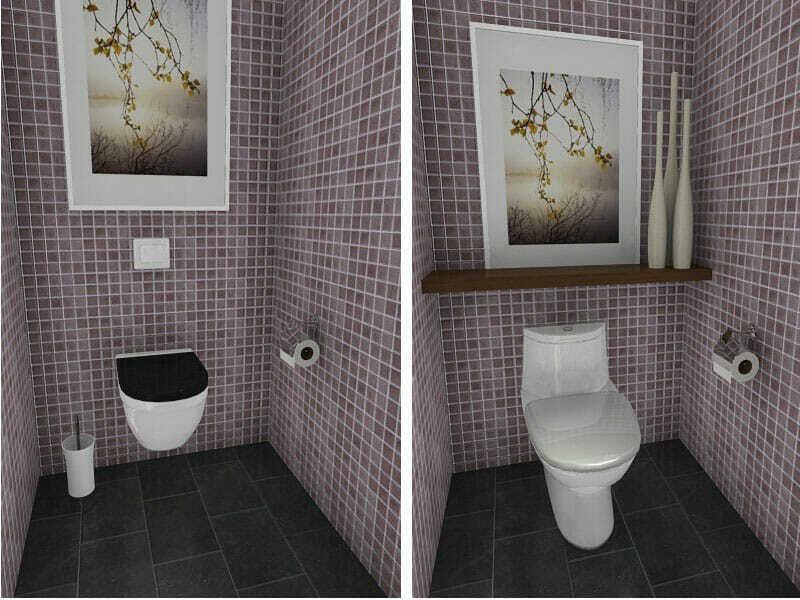 Just draw your bathroom floor plan, furnish and decorate it, and see your design in 3D – it’s that easy! For more bathroom ideas, tips and inspiration – check out the recommended posts below.